Cuban guitar maestro Compay Segundo has been buried in his hometown of Santiago de Cuba. Thousands of people took part in a funeral procession on Tuesday, singing one of Segundo's songs as he was lowered into his grave. 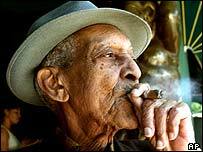 The cigar-smoking musician revived traditional Cuban music, and achieved worldwide fame in 1999, when he starred in Wim Wenders' film Buena Vista Social Club. He died of Monday from a kidney infection at the age of 95. 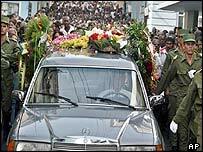 People threw flowers as Segundo's coffin - draped in the Cuban flag - was carried through the streets of Santiago. At the cemetery, the crowd sang a mournful version of Chan Chan - a song made famous by the 1997 record Buena Vista Social Club and Wenders' documentary. "He represented our culture to the entire world," said fellow Buena Vista musician Omara Portuondo, who attended the procession. "I would say that he is part of the Cuban flag," she added. No senior government officials appeared for the ceremony, though Culture Minister Abel Prieto attended a memorial service on Monday in Havana. Born Francisco Repilado in Santiago in 1907, Segundo learned his musical skills in the 1920s, but did not pick up his nickname until the 1940s - Compay was slang for compadre and Segundo referred to his bass harmony voice. His group, Compay Segundo y sus Muchachos, was formed in 1956 and was still active at the time of his death. However, following the 1959 revolution, he disappeared from music to roll cigars for a living. But he returned to acclaim in the late 1980s. In 1996 he released a new album - Lo Mejor de la Vida (The Best In Life) - to mark his 90th birthday. The soundtrack to Buena Vista Social Club sold more than four million copies around the world. Segundo's 1999 album Calle Salud was also widely acclaimed.